This is the complete opposite of a Meatless Monday post. This post involves meat. Lots of delicious, slow cooked, melt in your mouth steak. Now, I don’t cook steak very often – mostly because I don’t know how to consistently get it to a nice medium rare at home. I leave that up to the pros, and only order steak on the rare occasion I find myself craving one. 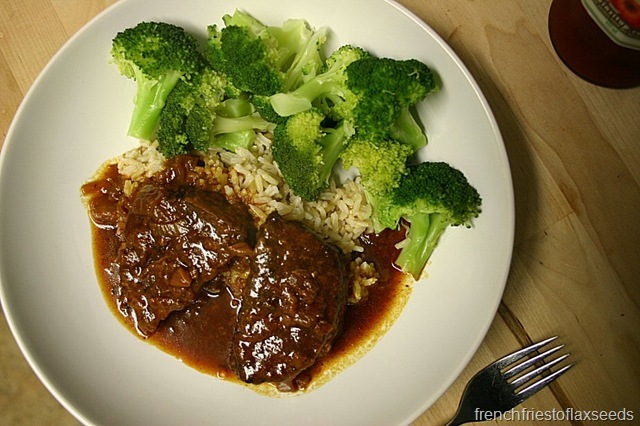 But the other day I was thinking, I really want to make this crockpot steak dish my mom would make every so often. Side note – do not spell “crockpot” without the “r” in it in a Facebook status update, otherwise you will end up with an array of rude, but hilarious, comments from your friends. Just sayin’. I called my mom up, and asked her to send me the recipe. I’m not sure where she got it from, but it was good enough to be transferred to a recipe card, and make its way into semi-regular rotation. Which means it’s pretty damn good. The great thing about cooking meat in the slow cooker? You can buy the cheap, tough cuts, and they will always turn out fabulous. Not to mention you come home to find your house smelling of delicious dinner. The key to this recipe is chili sauce. Not my beloved sriracha or sweet chili sauce. 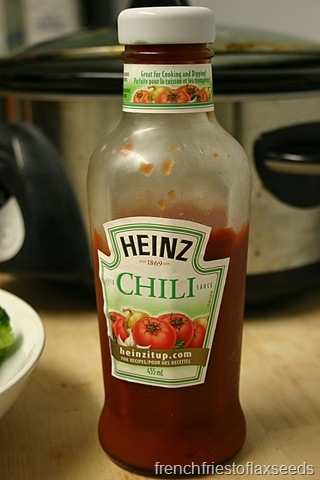 But this random condiment I would never have known existed were it not for my mom’s slow cooker chili steak. 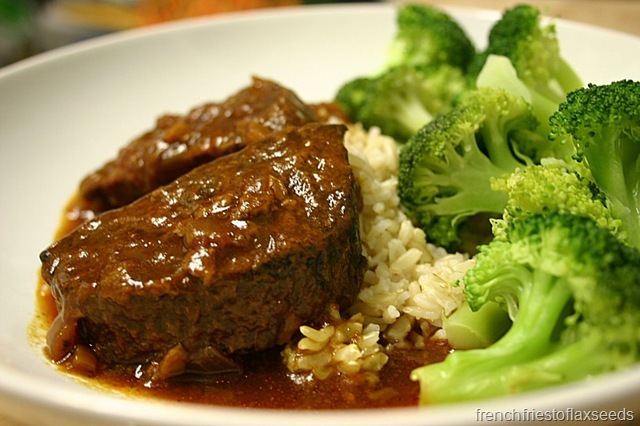 I love to serve the tender, spicy steak with something to sop up all the awesome sauce – we always go with rice, but any other grain, mashed potatoes, or some freshly baked bread would work just as well. Round it out with your favourite green vegetable, and you have yourself a tasty balanced meal. Oh, and the leftovers freeze well too! Okay, so maybe my mom didn’t come up with the recipe, but she’s the one who brought this dish into my life, so I’m giving her the credit. Aside from a little prep, the slow cooker does all the work, allowing you to come home to a delicious meal the whole family will enjoy. 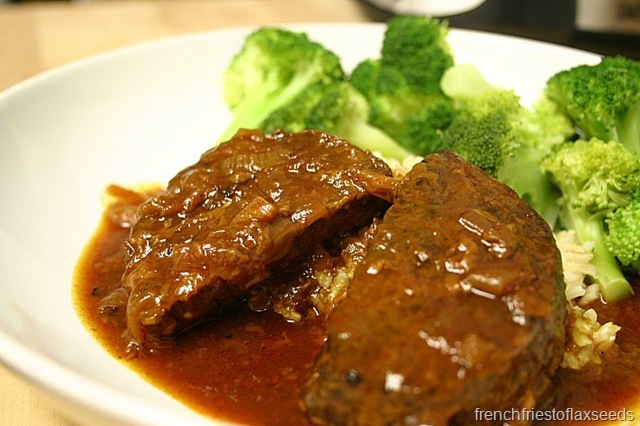 A nicely balanced sauce with a little heat fancies up even the cheapest cut of meat, and the slow cooker ensures it’s tender every time. 1. In plastic bag, combine flour, salt, and pepper. Add beef chunks in batches, and shake to coat. 2. Heat a large skillet or Dutch oven over medium high heat. Brown the beef in butter in batches. Transfer to slow cooker. 3. In the same skillet, add the remaining ingredients. Cook and stir until mixture comes to a boil. Be sure to scrape up those brown bits on the bottom of the pan (flavour!). 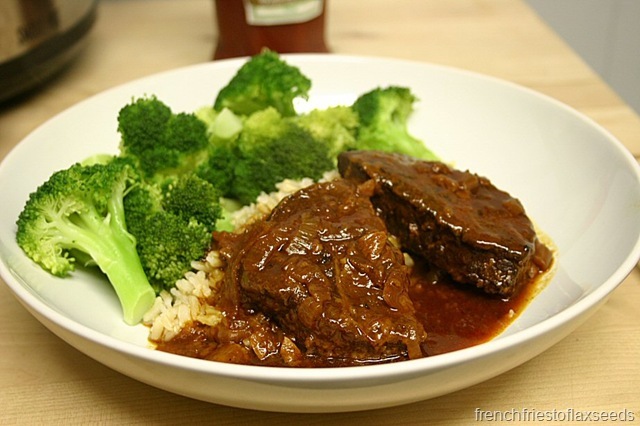 Pour over beef in slow cooker. 4. 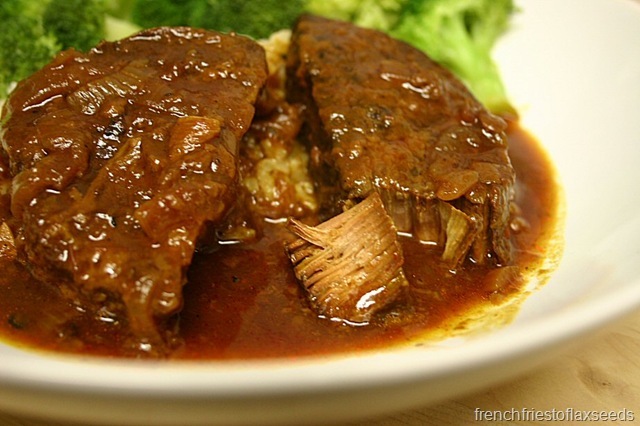 Cover and cook on low for 9 – 10 hours, until meat is tender. Note: You can even turn this into a shredded beef recipe once it is done cooking – it would make great (messy) sandwiches with some coleslaw. Have you mastered the art of the perfect medium rare steak? Any pointers? I’ve been seeing a lot of people post slow cooker recipes, as of late. It’s making me want to buy one of my own. We had to get rid of the last one we owned because it was too ginormous for the Coastal Casa. 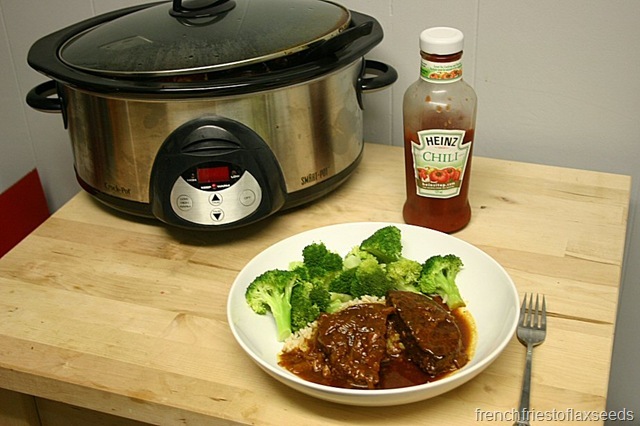 Pfft – if I can fit a slow cooker in my tiny closet of a kitchen, you definitely have room! Go for it! It’s definitely a family friendly dish! You can always leave out the extra chili powder if the kids aren’t into spice.